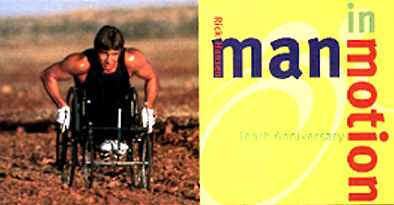 Rick Hansen of Vancouver, Canada, wheeled 25,000 miles around the world in 1985 in a stunning two-year marathon through 34 countries, changing a lot of minds about what 'possible' means. Today, after winning wheelchair marathons and competing in the Olympics, he's focused on building his Rick Hansen Institute to benefit spinal cord research and rehabilitation. 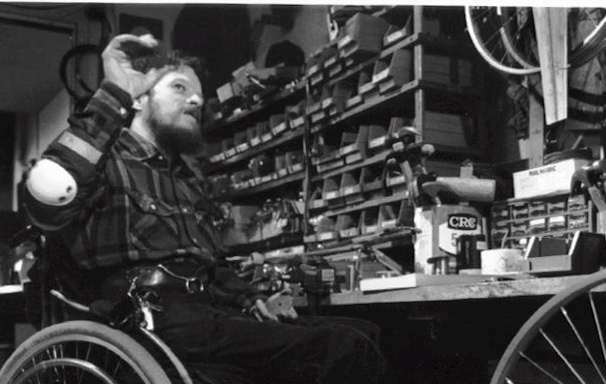 Ralf Hotchkiss, shown here in his California workshop, received the prestigious MacArthur Foundation Genius Award for his pioneering Whirlwind project to bring modern, inexpensive wheelchairs to the third world. Read more about his exciting venture here. Graham Sisson, at left, was paralyzed at 17 as he prepared to become a West Point cadet. 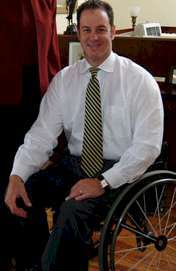 He is now a lawyer who serves as deputy attorney general of Alabama, specializing in disability issues. 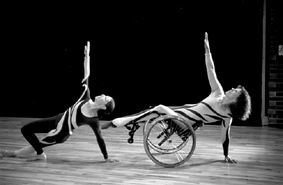 Patrick Schwabenbauer is with NASA's Goddard Space Flight Center in Maryland, and maintains a cleverly programmed personal website, currently offline..
Charlene Curtiss, artistic director of Light Motion dance company, shown above, performs, choreographs, and teaches wheelchair movement skills in Seattle, Washington. 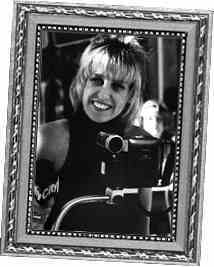 Mary Verdi-Fletcher of Cleveland, Ohio, founded the Cleveland Ballet Dancing Wheels in 1980. Jesse Daikan McKinney has written a powerful book on perceptions versus the reality of disability, A Mind on Wheels: The Inner Journey. Check out this website to preview some selected essays, which will convince you this is a 'gotta-have' publication. Mitch Tepper, left, graduate of Yale Medical School and Penn, founded the Sexual Health Network, to provide counseling, publications and seminars, with a special focus on sexuality and disability. Craig Sheely is a wheelchair-enabled photographer near Gettysburg, Pennsylvania. His superb collection may be sampled and bought at his website. 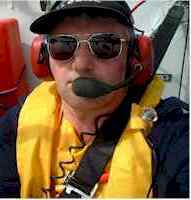 Steve Slade, above, a manager on the Eurofighter project for Rolls Royce, won Britain's National Microlight Championship last year, competing with able-bodied pilots. He has participated in the French championships as well. At the left is one of his display maneuvers. 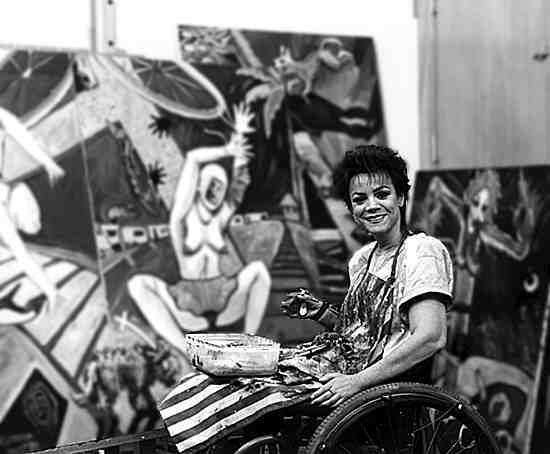 Elisa Terranova, a native of Liberia, shown above in her studio, is a gifted artist living in Folsom, California. Her works may be sampled at her web site. Doug Maurer is a computer systems programmer for the South Carolina State Ports Authority in Charleston. Dug Jones is director of the Center for Student Leadership and Activities at Santa Fe Community College in Gainesville, Florida. Greg Palumbo is city manager of Country Club Hills, Illinois, near Chicago.
. . . and all kinds of other devices. Help us recognize a variety of wheelchair users who set an example of ingenuity, perseverance, and good humor in the face of physical, vocational and social challenges. Email the webmaster to nominate your suggestions for recognition. If a photo is available, give us the URL or email it to us. Barry Corbet, above, was on the team that scaled Mount Everest in 1963, before his spinal injury. 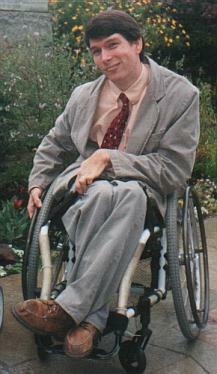 More recently, he was editor of New Mobility magazine, where he occupied a rolling "Bully Pulpit" on disability issues. Search the NM archives for 'Corbet' and read some of his work. 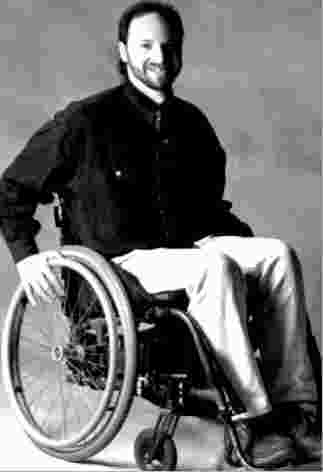 Mark E. Smith of San Francisco, above, overcame cerebral palsy to become a popular speaker and writer. 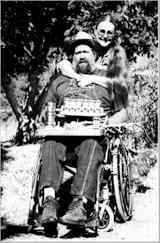 Visit his resourceful site, WheelchairJunkie.com for his expert advice on buying a chair, and essays by his alter ego, Count Cripula. You'll appreciate Mark's sharp wit and wisdom. Steve Mikita is assistant attorney general of Utah. Chris Sheridan of Los Angeles, above, is a filmmaker and New Age humorist who does one-man plays and has performed his 'sit-down' comedy act on the USA cable network. Explore his world here. Scott Duffey, a quadriplegic, paints remarkable abstracts and portraits on Long Island, New York. His works may be purchased through his web site. 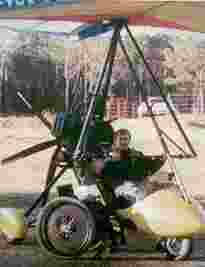 Steve Dowman of Orlando, above, invented 'The Grasshopper' with help from a group of fellow mechanical engineering students at the University of Central Florida. 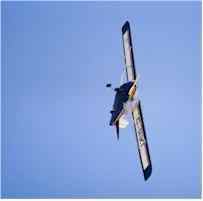 Sean Scott of Linden, North Carolina, above, loves to fly and gladly abandons his wheels to take to the air in his weightshift trike. Here's a story about his flights of fancy you'll enjoy! Sheree Sainz of Valdosta, Georgia, while a mother of two teens, earned a master's degree. She swims, teaches at a technical institute, plays wheelchair basketball. 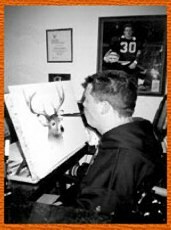 Todd Maness of Robbins, North Carolina, above, coaches high school football from his sip-and-puff wheelchair, and enjoys a career as an artist, painting with the brush held in his mouth. See and buy his paintings at his Red Rider Studios. There are many others. . .
Kenny Clayton of Madisonville, Kentucky, is a pharmacist. Dave Stange, coach of the Chicago Wheelchair Bulls, is a credit manager in Mt. Prospect, Illinois. Scott Kauffman is an accountant with a manufacturing firm in Bremen, Georgia. Bob Masella, above, owns his own law firm in Columbia, South Carolina, and is a competitive, nationally ranked wheelchair tennis enthusiast. 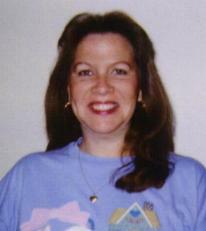 Jayne Fortson completed her medical degree and multiple residencies in dermatology while in a wheelchair. 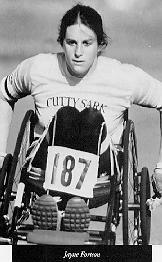 Injured in a caving accident while in college, she went on to become a winning wheelchair athlete. Since 1990 she's lived in Anchorage, Alaska, where her young family and a thriving medical practice share time with skiing and swimming. Nate Besio became a quad from a 1990 diving accident and then a hearing- impaired bilateral arm amputee from a 1992 case of Meningococ-cemia. Today, as business manager at the Vermont Genetics Network at the University of Vermont, he credits his success to family, mentors, friends -- and a positive approach to life. "I made people see me, not the disability," Nate says. Marshall Luskot is an organic farmer in Platina, California, who adapted his farm equipment for wheelchair use and now owns an Herb Blossom Farm. John Ryan, above, a realtor in Whistler, British Columbia, handcycled across Canada in summer 1999 raising funds for spinal cord research. Wendy Murphy, above, is an on-camera reporter covering community events for CityTV in Toronto, Ontario. 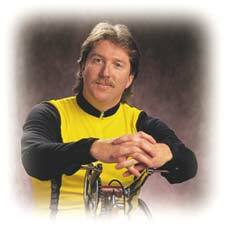 Don Vandello operates a plumbing supply in Walworth, Wisconsin, and plays wheelchair basketball for Chicago. Eddie Bland is a middle school principal in Rochester, Texas. Paul Aziz, above, was injured in a diving accident in 1983. 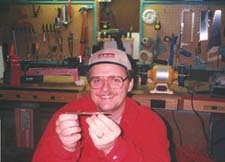 Today he is an Oregon wood-carver who handcrafts music boxes, bowls, vases, pens, letter openers and desk sets. You can buy his creations on his website. Richard Fuchs is a 12th grade school teacher and motivational speaker in Salt Lake City, Utah. O.J. Waddell, injured in a 1979 drive-by shooting, spent 16 years persuading the California Horse Racing Board to license him as a harness racing driver, but he succeeded. Today he competes as the sport's only para driver.